Yet another fake LinkedIn invite landed in my inbox today. Just for the fun of it, I decided to dissect the fake invite. 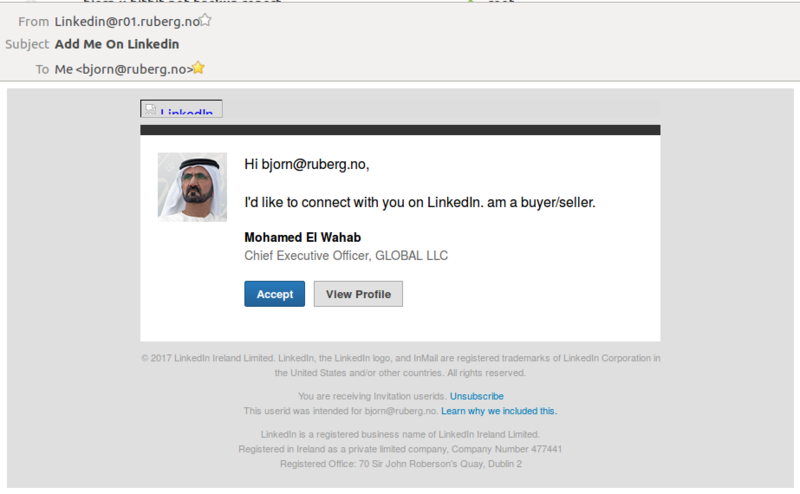 The first thing that caught my attention was the email’s subject: Add Me On LinkedIn. Normally, LinkedIn invite requests appear as polite and humble, this one not so much. Next was the sender address. LinkedIn has most of their ducks in a row when it comes to email standards compliance, which you should do when you’re a mass mailer, but this one didn’t even care to fake a sender email address. The header registered by my mail server was simply From: Linkedin (just the name, no email) when receiving the message; my mail server’s address has been appended in the final representation. Then there’s the fact that every clickable item in the email links to a South African site, hxxp://simplystickerz.co.za/, identified as harmful by five different vendors at Virustotal. The last dead giveaway was the image of the alleged sender. While not visible in the email itself, the email was supposed to include the image from a remote URL in the ggpht.com domain. The domain belongs to Google and is used for serving static images for YouTube and other sites. A quick Google reverse image search revealed that this was no other than Mohammed bin Rashid Al Maktoum, the Vice President of the United Arab Emirates. Other details include broken or missing images, backgrounds, and buttons. The scammers even made an (unconscious?) effort to link some of them through Google caches/proxies. 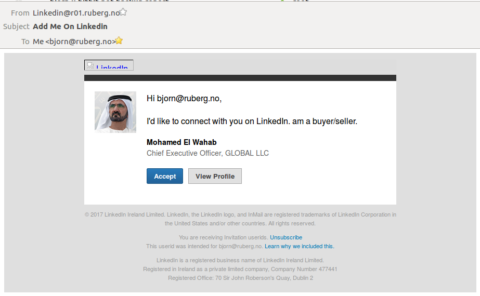 If at all intentional, it could have been to avoid LinkedIn getting suspicious over multiple unrelated image requests. It’s only too bad that none of the destination URLs exist, causing broken images in the email.